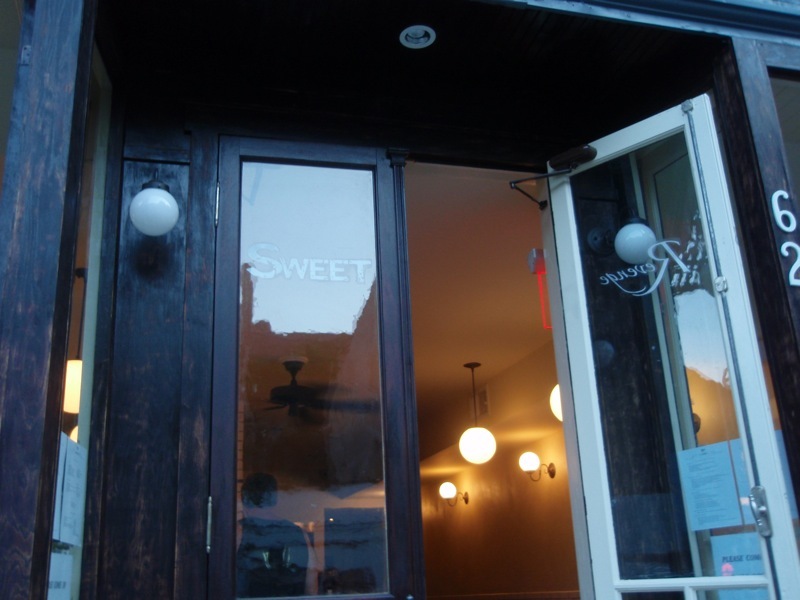 On Sunday evening, I went with my friends Matt and Desiree to the just-opened (on July 11th) Sweet Revenge at 62 Carmine Street. All photos by Rachel Kramer Bussel. See my entire photo set here. 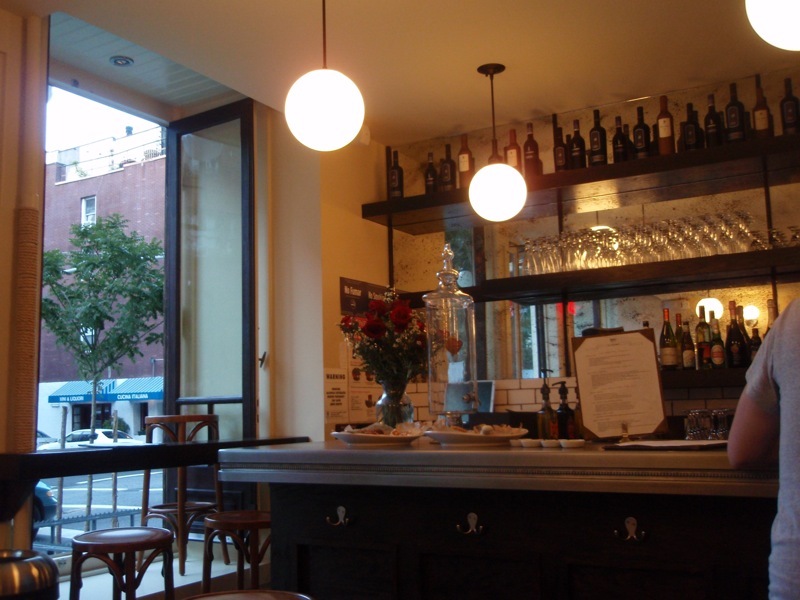 It is much more than just a bakery; it's more akin to a wine bar or cafe, and focuses on desserts, including plenty of cupcakes, as well as savory baked goods (perhaps to appease people like the guy who walked in and demanded, "Do you have any real food? Like meat?"). We tried all four cupcakes on offer that day (they also have cupcake/ice cream desserts, but we didn't get to try those): Pure (Vanilla/Vanilla), Mayan Chocolate Cake, Sweet Revenge (Peanut Butter), and Crimson and Cream (raspberry red velvet); see below for full cupcake menu. 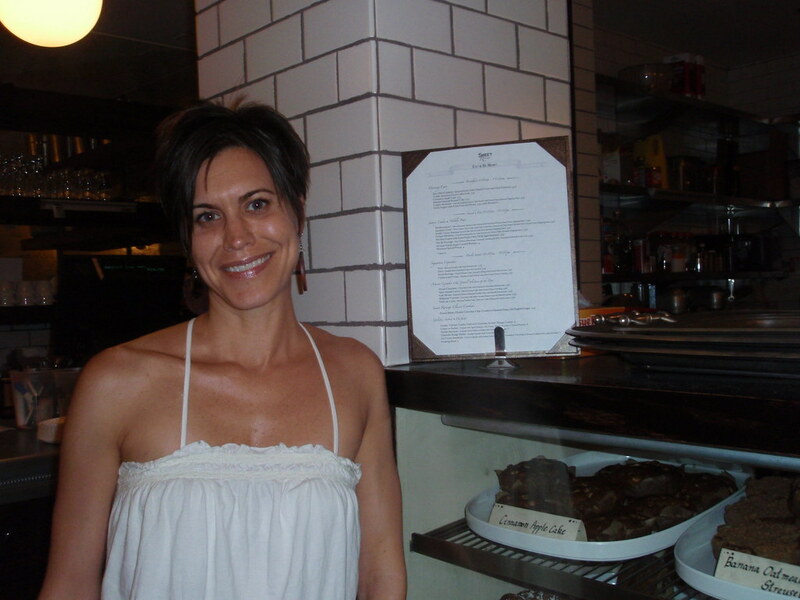 We got to chat with owner Marlo Scott, who seemed exhilarated but also exhausted from her first three days in business. "I wanted to create the feel of a world bistro. 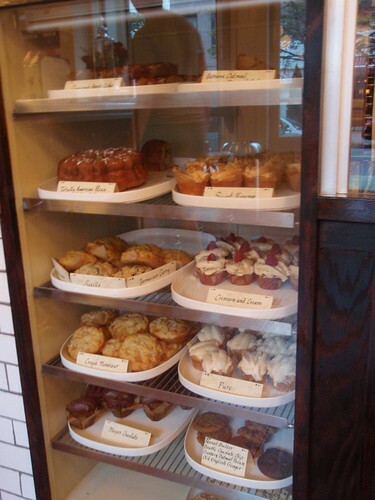 I wanted to get away from the cutesy cupcake bakeries," she said. She started baking cupcakes in 2005, and perfected her main recipes, for chocolate, vanilla, red velvet and peanut butter cupcakes, but needed help with the savory cakes. She brought in a culinary chef and restaurant consultant to help her achieve her vision. We tried the Jamiacan curry cake (admittedly, not a cupcake though) and it was delicious. "I thought I could do something a little different. When I made cupcakes for my friends, we were always having beer and wine with them; we weren't having milk." Hence, the very adult atmosphere of Sweet Revenge. They serve beer and wine, and foods inspired by international destinations. Scott did her homework, too. She went out and scouted local bakeries and crunched numbers to figure out just who was buying New York's cupcakes. While she "was convinced it'd be 95% female," she found that the customers were 70% women (average age low to mid 30's) and 30% men (average age high 30's). 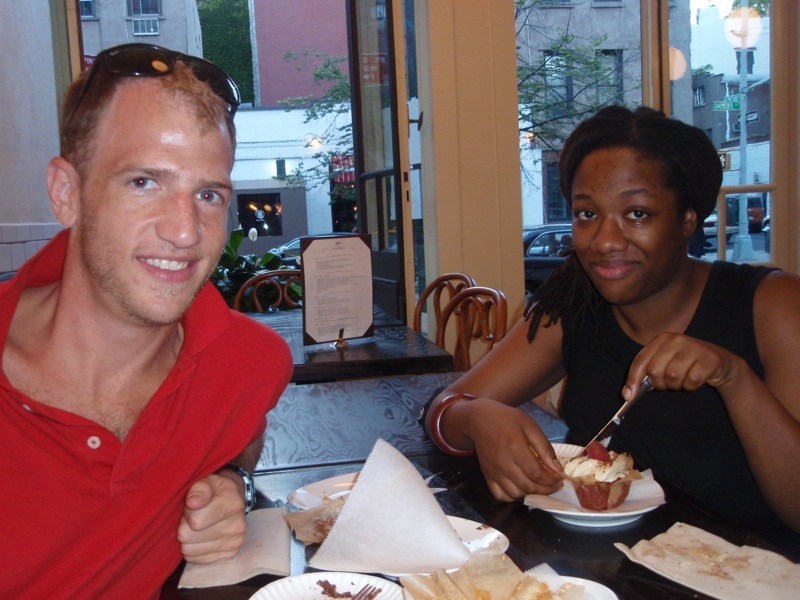 “I’m a cupcake snob, and I’m really impressed," said Desiree. My personal favorites were the peanut butter (Sweet Revenge), and the raspberry red velvet (Crimson and Cream). The peanut butter buttercream frosting was so smooth and silky, like a very light, sweet peanut butter, with little bits of peanuts thrown in. 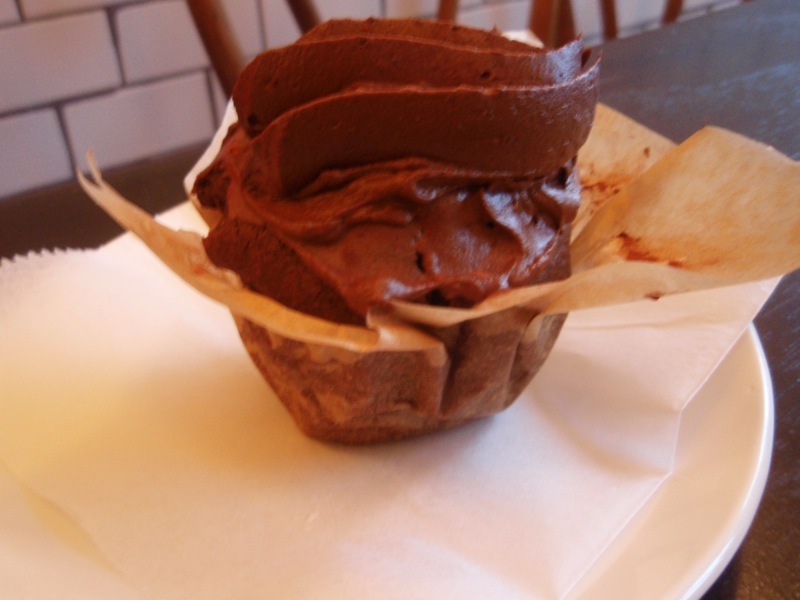 And for you chocolate/peanut butter fans, there was just a dollop of chocolate ganache inside. The fillings were not overwhelming at all; a little goes a long way. The raspberry red velvet was probably the moistest cake we tried (Matt feels that the cake is of utmost important and found them all on the dry side). It had a raspberry on top and raspberry filling inside, which provided a slightly different taste. The Mayan Chocolate cupcake was the weakest of the bunch. The frosting was great but the cake was too dry, and overall it just wasn't that special. The others, though, were velvety smooth, delicate, and delicious, though definitely the frosting outweighed the cake. These were good sizes for sharing, and were also piped in an interesting way; as you can see, they don't look like your average cupcake. I'm looking forward to going back and trying more; they'll be rotating the artisan flavors and seeing how that should work from here on out. Scott also said that once she has the hang of running Sweet Revenge, she definitely wants to do catering. They serve breakfast, lunch, and dinner, and I think Sweet Revenge would make a great date spot. I like that they have savory offerings as well as cupcakes, for as much as I love cupcakes, often after one of our cupcake meetups, I crave something to counteract the taste of all that sugar. Sweet Revenge offers that in a sophisticated, pretty environment (they've got a bird painted on the ceiling). As the proud aunt who commented over at BoomanTribune, I just wanted to say thanks for the great write-up and fantastic pictures! 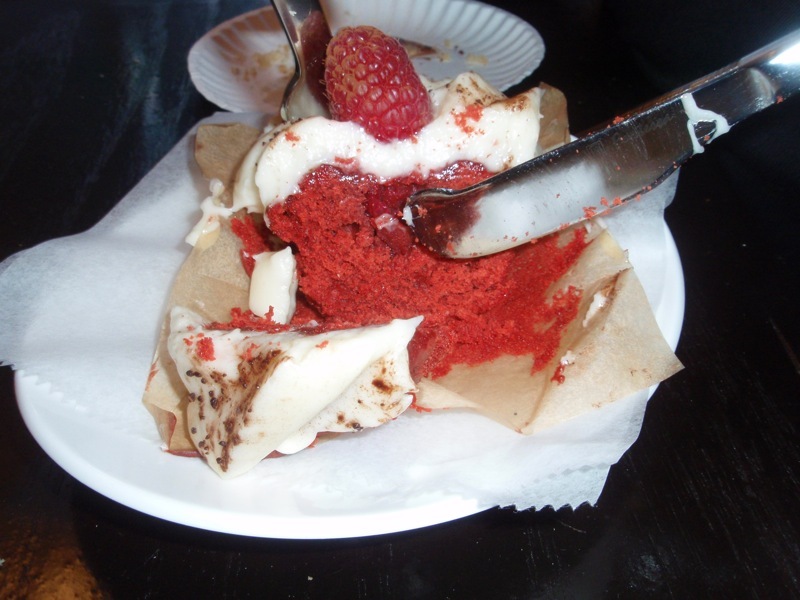 I am hooked on the Red Velvet cupcake from Sweet Revenge like an addict now. It was so moist and tasty and the frosting is a little piece of heaven. YUM! 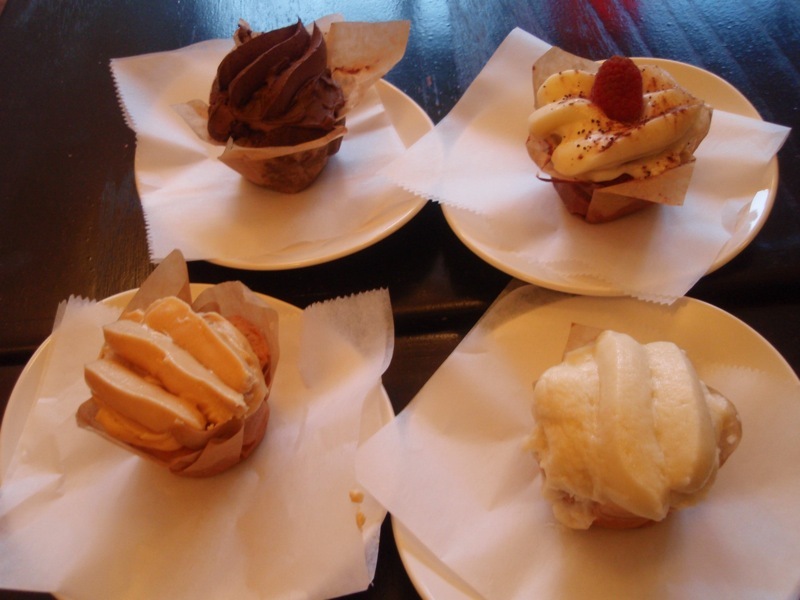 My friends from Park Slope were raving about the cupcakes- so I gave the shop a try and did not leave disappointed. The cupcakes were wonderful!!! 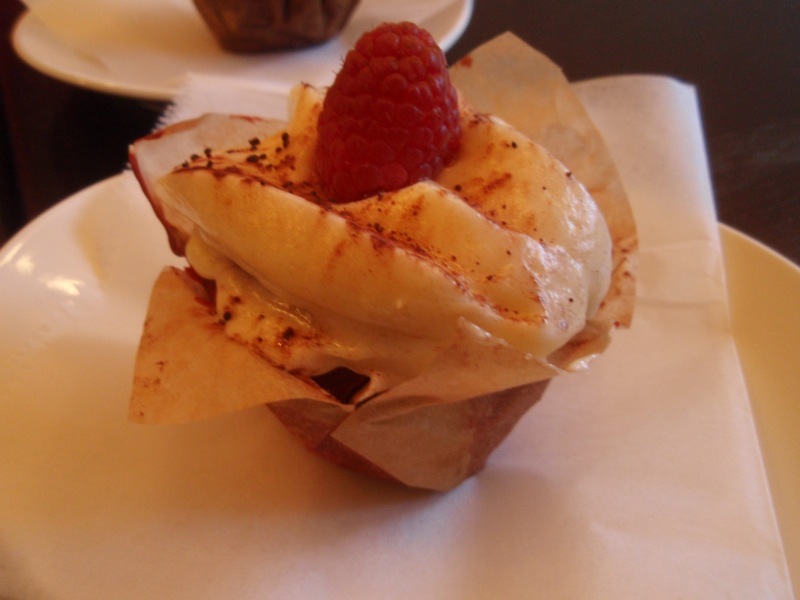 WHen I found this place, confusingly I feel happy that it was hard to find, and tried the cupcakes I fell in love with them. If only they had a pudding I could take away too. Have been back to Sweet Revenge several times now and it's great! We loved being able to sit at the bar and have a drink with our cupcake. The owner... Marlo was really friendly. We wish her lots of success! We'll be back again!